The moon is seen in mid-eclipse on Oct. 8, 2014 in this photo from the Adler Planetarium in Chicago, Illinois. The image was captured at 4:50 a.m. CDT as the moon neared the peak of a total lunar eclipse, the second of 2014. A total lunar eclipse is set to rise above people across a large swath of the world early Wednesday (Oct. 8). Weather permitting, people in North America, Australia, western South America and parts of East Asia will be able to see the total lunar eclipse. Sometimes, when the moon dips into Earth's shadow during an eclipse, the natural satellite takes on a coppery-red color, leading some people to dub it a "blood moon." The eclipse should reach totality just before sunrise at about 6:25 a.m. EDT (1025 GMT) on the east coast of the United States. Watch the Live Webcast. 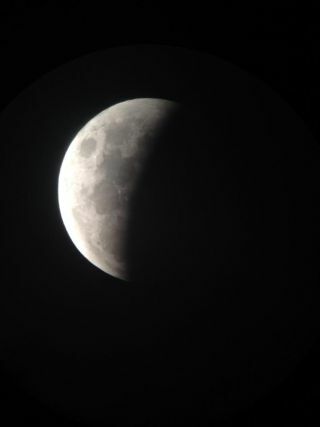 The amazing total lunar eclipse thrilled skywatchers areound the world. See some of the amazing photos they sent in to Space.com here. See the first photos of the amazing total lunar eclipse here. If you snap an amazing picture of the Oct. 8 total lunar eclipse, you can send photos, comments and your name and location to managing editor Tariq Malik at spacephotos@space.com. This visibility map shows the parts of the world that can see the total lunar eclipse of Oct. 8, 2014. NASA and the Slooh Community Observatory will air webcasts featuring live views of the total lunar eclipse from around the world. The NASA webcast will begin at 3 a.m. EDT (0700 GMT), and Slooh's webcast will start at 5 a.m. EDT (0900 GMT). What will your weather be like when the total lunar eclipse rises Wednesday? Learn how you can photograph the total lunar eclipse from an astrophotographer. See how to see three different webcasts of the total lunar eclipse on Space.com here. See our step-by-step guide of the Oct. 8 total lunar eclipse as it changes from a full moon to a so-called "blood moon" at its peak. For observers on the east coast of the United States, the total lunar eclipse might also be a rare "selenelion" - a celestial event in which the setting, eclipsed full moon and rising sun can be seen in the same sky. Learn how to see Uranus shining during the total lunar eclipse on Oct. 8. NASA scientiststs think that the moon might turn a coppery-red color during the total lunar eclipse. The red hue of the moon during an eclipse is created by the way light reflects on the natural satellite. October will bring a total lunar eclipse, partial solar eclipse and more for stargazers. Here's what to look for. Lunar Eclipses: What Are They; When is the Next One?